Welcome to my stop on the Love 101 Blog Tour! There’s an excerpt and giveaway below! Prudish school teacher, Cheyenne, loses a bet with her students and is forced to wear her student’s uniform. On the same day, she meets the devilishly gorgeous Evan Crane who is desperately lost and needs “assistance” getting home. Fighting his attraction to who is think is just a high school student, Evan finds he needs her help. Deciding to take advantage of his weakness and her own mounting attraction to him, Cheyenne kisses Evan. That’s when her plan to just tease the stranger becomes a chance for her to live out her own reckless fantasy. Yet, when the tables are turned and she reaps what she has sown, Cheyenne has to make a choice to forgive Evan and overcome her own fears or miss out on the most perfect love any woman could ever have. Sequel to Love 101 (included in Prologue) and the continuing saga of Mistaken Identity series. 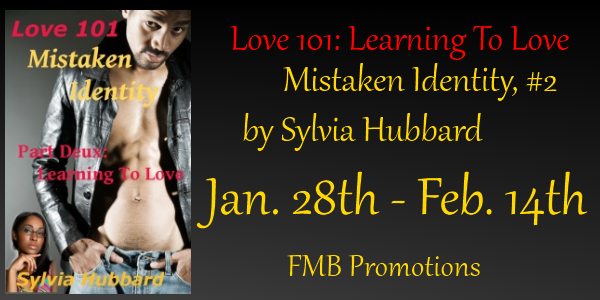 GIVEAWAY: If you are doing a giveaway it is tour wide for a eBook copy of Love 101: Learning To Love by Sylvia Hubbard. Ends 02/21/2013 Please use the Rafflecopter HTML below! Today, she has independently published over 28 books, is the founder of Motown Writers Network and The AA Electronic Literary Network, CEO of HubBooks Literary Services, runs over five blogs on a variety of subjects, host The Michigan Literary Network Radio Show and is a happily divorced mother of three children in Detroit, Michigan. Considered an addicted blogger by HoneyTechblog.com, nominated and recognized for her literary work in the Metro Detroit area, referred to as “A Literary Diva” by Detroit City Council and donned “Cliffhanger Queen” by her readers, she finds solace in speaking and educating on a variety of topics. Her subjects range from Social Media, Internet Marketing, Creative Intimacy, Single Parenting, Blogging, E-Books, Publishing (all aspects i.e. : writing, publishing, marketing & promoting online & offline), and personal triumphs with inspiration mixed in. Never a disappointment, Sylvia Hubbard, has spoken in front of thousands all over the United States and Canada and has been an Amazon Bestseller.